Alrightly then. Here is part two of the collection. I've put all the greens together so you can compare them. 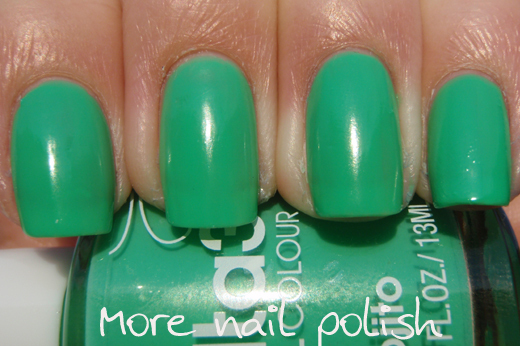 Tahitian lime - three coats, no top coat, full sun. A bright lime green. Yellower than Jelly, but also much more opaque. I'm not too sure about this colour, it's really, really green. And we all know it's not easy being green. In fact it really is kermit the frog green! Mermaid green - two coats, SV top coat, full sun. This is a really pretty blue green creme. I'm sure there would be other brands that have similar a colour, but I don't own many creme polishes in other brands, cause I generally wear shimmers, flakes, glass flecks or holos. So if you know what other colours it looks like, please let me know. Mojito - yuuummm yes please. Two coats, no top coat, full sun. I'm finding it really hard to describe all these different green shades. But hey, you can see what colour it is, right? I probably should have done a third coat on this one, it's not streaky or anything, but I can see VNL. Does that make it a jelly polish? Orchid - one coat, no top coat, full sun. Orchid feels a little like the odd man out. I feel like singing in sesame street tunes "One of these shades is not like the others, one of these shades just doesn't belong, can you tell me which ..." and so on. So yeah, here we have an amazing purple shimmer, in with a bunch of creams. Remember the Autum/Winter collection with all the fever polishes. They were all shimmers with the exception of one purple creme. And now here is the purple shimmer in amongst all the cremes? Anyway, to me, this polish is the stand out. This is only one coat. The formula of this one was so much easier to work with than all the others, and although it uses the same brush, it didn't drag. 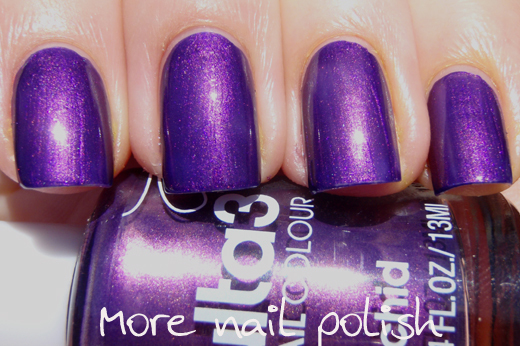 If you only grab one of these polishes, this is the one to get. I loved it so much that I decided to stamp it with China Glaze 2030, using a Bundle Monster plate and wear it for a few days. One coat?! Amazing. I love the greens, too. Must ... get ... orchid!!!!!! Love Mermaid Green! I was going to get it yesterday but then held back....I really shouldn't have! They all look AMAZING but Orchid is just the bomb. 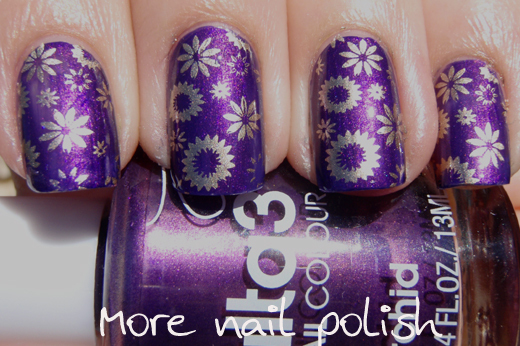 Your stamping is perfect, I love it!!!! All of them are so beautiful!! Love the greens! But they are all lovely! How beautiful is that purple! Love it with the stamp! Just wanted to let you know I got my color morph-ers safely today, thanks so much! PS Omg omg omg, I tried the Spectraflair last night and did a super quick franken.. and I LOVE IT!!!!! Far out, it is so easy! Hopefully I'll get time to swatch it tonight. Fingers crossed!! Kristy - Thank you, I usually can't think of many ideas for stamping, but this came out nice. olgiepolgie - IKR, one coat. I think I like the greens, but I'm not sure about Tahitian Lime. Gen - I'm surprised they don't sell Ulta3 in NZ. I'm sure they have a NZ phone number printed on the bottle. Joan - for $2.25 you might have to go try and find it again. It is quite a pretty green. Em - Yep, Orchid is awesome and for $2.25! Oh and I can't wait to see your Spectrafranken. SayAnythingBrooke - fantastic, I'm looking forward to seeing pics of your frankens.